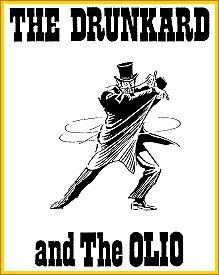 Boo, hiss, cheer, laugh and sing at the Spotlight Theatre's presentation of "The Drunkard" and the "Olio." The Drunkard holds the record as the longest continually running play in North America having performed since November 14, 1953. This adaptation of the melodrama "Ten Nights in a Barroom," originally written in the late 1840s as a preachment against alcohol, is now performed as a comedy. The Olio is a variety show consisting of 1-2 acts of local talent, some of whom have recording contracts and have appeared on national television. 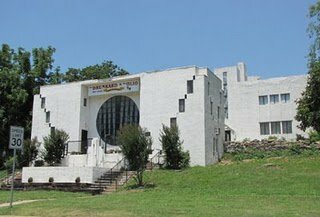 The home of the play is one of Tulsa's Art Deco treasures, originally known as the Riverside Studio and designed by internationally known architect Bruce Goff is listed on the National Historic Registry. The theater is also home to award winning children's theater productions since 1997, and designed to introduce young patrons to live theater. Office hours above; performances Saturday at 7:30pm. Ticket prices range from $12-$18. While every effort has been made to ensure the accuracy of the pricing listed above, prices are subject to change without notice. Exit US 75/US 64 at Houston exit near downtown. Travel S on Houston 3 blocks to Riverside Dr. Theater is located at intersection of Houston & Riverside.